Do you ever have weeks, months, or quarters that you are cranking out the work, meeting all of your goals, and checking off all the things on your to-do list only to be followed by a period of time that you can’t seem to get motivated to do anything at…regardless of how much coffee you have? It has happened to me more often than I care to admit! It’s called work paralysis. Yep! It actually has a name. AND…there is good news! 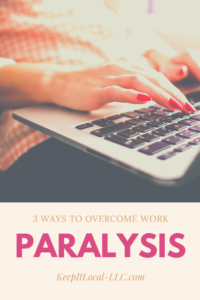 In this post, I am going to share 3 ways to overcome work paralysis. Before we even get into how to fix work paralysis, we need to know what it looks like. It looks something like what I mentioned above – the inability to get your work done due to apathy, lack of motivation, or maybe even boredom. All of this is NORMAL. Even though you may be working in a job you love, you will go through peaks and valleys. Sometimes the work can be uber-fulfilling and other times, meh, not so much. 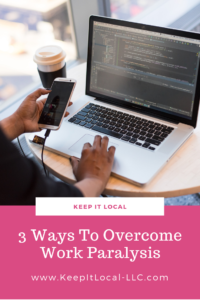 The tricky part is getting through the “meh” times that lead to work paralysis. 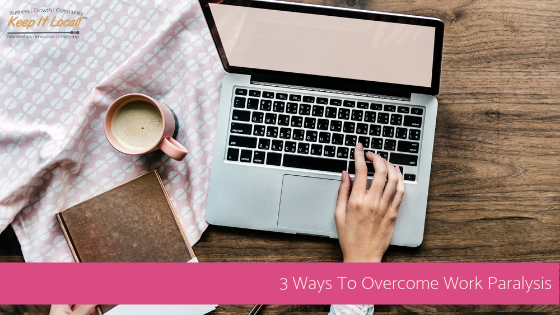 The 3 ways to overcome work paralysis will help you get through the “meh” and get back on the high of loving what you do! When we are in “meh” mode, everything on our to-do list can look overwhelming and out of control – just adding to the work paralysis you already feel. When you start feeling work paralysis set in, take a look at your to-do list and prioritize what needs to be done first. Tip #2: Pick 1 Thing and Finish Strong. Now that you have prioritized your to-do list. Pick the one thing that your business life depends on and make a plan to get it done. Block off time to do nothing but work on that one task or project and finish it…all the way. Don’t leave any loose ends. Leaving loose ends will just prolong your work paralysis. Tip #3: Baby Steps and Celebrate the Little Wins. Once you have picked the one thing you have committed to finishing, you have blocked off time, and you’re ready to get working, break the project or task down into baby steps. Complete each baby step until the project is completed. Celebrate each time you complete a baby step. This process helps to give you the motivation to move on to the next task or step in the process. The three tips above are really just a catalyst to get you started. The hardest thing about work paralysis is getting started. The motivation to just hit the “GO” button is often the most difficult. It’s kind of like jumping into a cold swimming pool on a hot day. Getting up the courage to jump in and feel the icy water rush over your body is the hardest part. Once you are in the pool, your body quickly acclimates and you are swimming around in no time. Jump into your work, start swimming, and you will be back on track in no time!